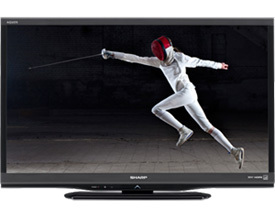 The Sharp LC-32LE450U LED TV is the bottom of the barrel for Sharp's 2013 lineup. That doesn't mean this TV isn't worth some attention. It's a solid budget offering for the most basic 32 inch TV. The package is bare bones without many feautures, as is standard for the budget televisions. The panel offers a 60Hz refresh rate with 720p resolution. It won't compete with top of the line TVs, but these specs are decent for the size.For a little more flexibility with external devices, the LE450U is equipped with 2 HDMI inputs. The Sharp LC-32LE450U LCD TV (backlit with LED lighting) has a great picture quality but does require some calibration out of the box as colors may seem a little over saturated especially in the Vivid Dynamic picture mode. One thing that I like about it is the ability to have two custom settings – one for maybe movies and one for broadcast or cable TV programming. They will look very different on this huge TV. Side angle viewing on the LC-32LE450U was slightly hazy as we noticed a loss of contrast from around 20 degrees off center. The 32LE450U is attractive is a sublte sort of way.Thin half inch bezels that surround the screen are very unintrusive. In fact, the left and right bezels are darker than the top and bottom. This gives a frameless appearance at first glance. The stand is oval shaped and is glossy black plastic. Being a budget TV, there is more depth to the cabinet. This will only be noticed if the TV is going to be wall mounted. 2 HDMI ports head up the connectivity of the 450U LED from Sharp. Many budget TVs out there only have 1 on board. 2 inputs makes it much easier to manage a video game console and a blu-ray player. There is 1 USB port that allows users to plug in an external hard drive or memory stick for photo, video, and music playback. The USB port is useful for getting content from digital libraries onto the big screen. There is a sea of 720p budget LED TVs out there. The Sharp LC-32LE450U fits right in. Price and slight variations in picture quality are really all that differentiates them. Sony's KDL-32R400A is a strong competitor for picture quality, but at $50 more. The Panasonic TC-L32B6 is a direct competitor with an IPS LED panel for about the same price.